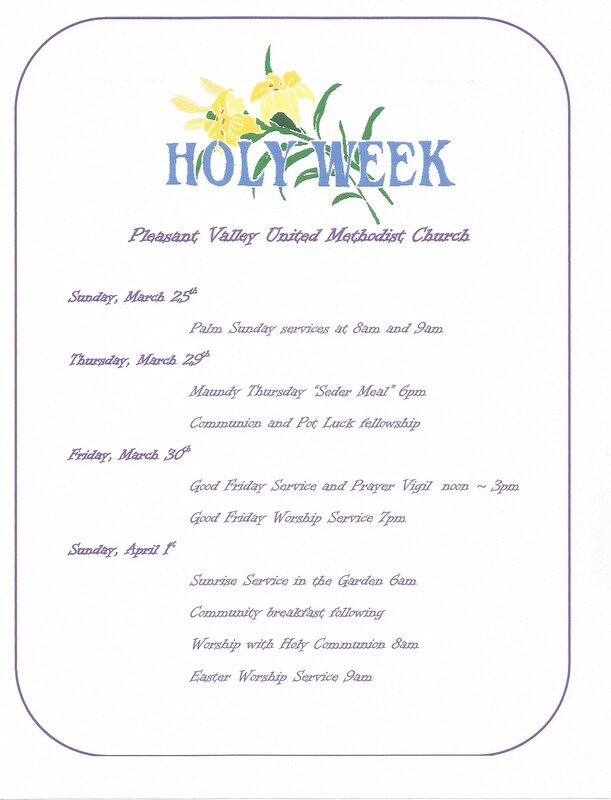 Listed below are the worship services and events happening at Pleasant Valley United Methodist Church during Holy Week, March 25th through April 1st. As you look over the opportunities for worship leading to Easter Sunday, you are most welcome to come join us in any and all of the events. Should you have any questions regarding this schedule, or about our church in general, please call the church office at 860-379-2157 and leave a message. Someone will return your call as soon as possible. In the meantime, we wish you peaceful times of reflection on the love of our Father in Heaven, and the sacrifice of His only son, Jesus Christ, and ultimately of the victory over the grave on Easter Sunday. May God send His blessings to you and your loved ones. For a larger view of this event list, simply click on the schedule.